I’m not sure why everyone is so freaked out about this pretty ordinary tale about a door-to-door salesman and his quest for meaning in a brutal work environment. The love affair between Winston and Julia is touching, though I’m not sure why it’s so …more I’m not sure why everyone is so freaked out about this pretty ordinary tale about a door-to-door salesman and his quest for meaning in a brutal work environment. The love affair between Winston and Julia is touching, though I’m not sure why it’s so important that she fetishes the vacuum attachments Winston is trying to sell her on their first meeting. 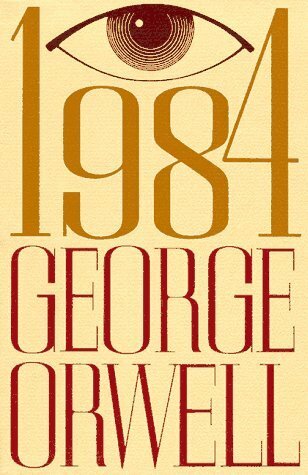 I was also impressed by Orwell’s ability to predict the rise of Fox News. You’d think an adventurous post-apocalyptic story would have more pitched sea battles and swordplay, so I was really disappointed with this book. There was only one boat, no pirates, and the violence wasn’t very romantic. I dares ya to buy it as a t-shirt. Alltop likes its baby with carrots.